Voluntary life insurance is a form of term life insurance that is offered through employers. Employers offer voluntary life insurance to ensure that employees have the opportunity to purchase the amount of insurance needed at a group rate. All groups that offer voluntary life insurance also offer basic term insurance that is normally paid for by the employer. While this depends on various situations, voluntary life insurance may have significantly lower premiums than term life insurance. Before you decide which policy to choose, you should understand how these two policies differ and the advantages and disadvantages of each policy. To begin, what exactly is the difference between these two insurance policies? Voluntary life insurance will usually be offered in multiple of your salary with the company rather than in arbitrary amounts that you can choose from. An example of this would be if you had a salary of $40,000 a year, you are able to buy voluntary life insurance in increments of 40, 80, or 120 thousand dollars. This differs from standard term life insurance, because you are able to obtain this outside of your employer, although you can obtain this through your employer as well. Typically voluntary life insurance is cheaper for amounts under $50K, while term life policies are more affordable for higher values. These kind of policies are much cheaper and inexpensive than other policies such as whole life, variable life, or universal life policies that offer a cash value. Function – Similarly to other types of life insurance, voluntary life insurance offers a death benefit. Since voluntary life insurance enables you to receive group rates, it is significantly cheaper than term life insurance that you can purchase outside of your employment. This is why this option is very common for individuals that make under $50K. Size – The size of a voluntary life insurance policy can be extremely high. For example, if you have health issues and have the opportunity to purchase voluntary life insurance, there often is a guaranteed issue amount that can be a significant amount, sometimes it being over one million dollars. This also means that you do not have to answer standard health question to receive coverage, unlike with a standard term life insurance policy. Normally, a smaller guaranteed amount is available for spouses and children. Once again, term life insurance independently will require you to answer health questions when there is a large sum of money involved. Benefits – If you decide to leave your employer or switch jobs, you will take the coverage with you as term, but usually it will be converted to a higher-cost whole life insurance policy. In other policies, whether voluntary life or term you purchase on your own, there is an accelerated death benefit. This means that if you discover that you are terminally ill with less than a year to survive, then you can use as much as a significant amount (around 75%) if the death benefit for anything you desire before you pass away. After this is conducted, the balance left over within the funds is then given to your beneficiaries. Also, both personally owned term life insurance and voluntary life insurance have a waiver of premium benefit that pays the premium if you are disabled. Overall, there are various benefits associated with obtaining either of these policies. Misconceptions – One of the most common misconceptions is that while there is a guaranteed issue amount on most voluntary life insurance, larger amounts or amounts purchased after the enrollment will require you answer medical questions or you may even have to receive a physical. This process will be the same as when you purchase term life insurance for yourself. Understanding these components may aid in helping you locate which policy that would be the most beneficial for your or your family. What Should I Choose – Standard Term Life Insurance or Voluntary Life Insurance? With each form of life insurance, there are various pros and cons associated with each. 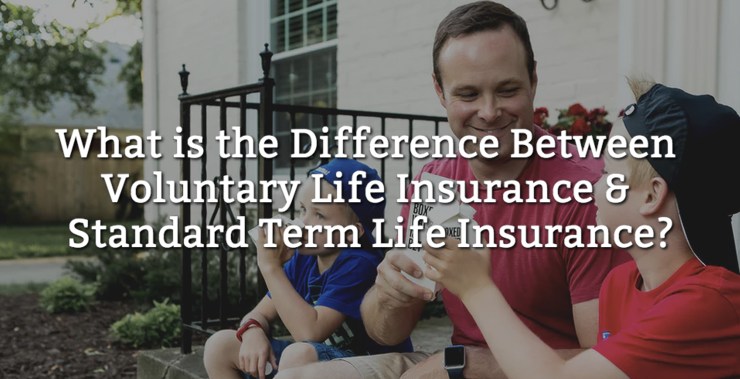 While you are able to obtain standard term life without your employer, voluntary life insurance is offered through them, may be cheaper, and is also paid through your paycheck – which completely eliminates the need to remind yourself to pay the bill. The only downside to this option is that your voluntary life insurance will not move jobs with you, and conversion fees are prohibitive. Therefore, if you believe that you are on the fence about your job and may change companies or careers soon, then a standard term life insurance policy outside of your work may be the better option for you. With all of this being said, it is important to speak with a life insurance agent before making any decisions regarding your life insurance policy.